An image of the massive galaxy cluster MACS J0454.1-0300. This is a list of the largest cosmic structures so far discovered. The unit of measurement used is the light-year (distance traveled by light in one Julian year; approximately 9.46 trillion kilometres). This list includes superclusters, galaxy filaments and large quasar groups (LQGs). The list characterizes each structure based on its longest dimension. Note that this list refers only to coupling of matter with defined limits, and not the coupling of matter in general (as per example the cosmic microwave background, which fills the entire universe). All structures in this list are defined as to whether their presiding limits have been identified. The Zone of Avoidance, or the part of the sky occupied by the Milky Way, blocks out light to several structures, making their limits imprecisely identified. Some structures are far too distant to be seen even with the most powerful telescopes. Some factors are included to explain the structure (like gravitational lensing and redshift data). Some structures have no defined limits, or endpoints. All structures are believed to be part of the cosmic web, which is a conclusive idea. Most structures are overlapped by nearby galaxies, creating a problem of how to carefully define the structure's limit. Hercules–Corona Borealis Great Wall (2014) 10,000,000,000 Discovered through gamma-ray burst mapping, and is the first structure to exceed 10 billion light-years. Giant GRB Ring (2015) 5,600,000,000 Discovered through gamma-ray burst mapping. Largest-known regular formation in the observable Universe. Huge-LQG (2012-2013) 4,000,000,000 Decoupling of 73 quasars. Largest-known large quasar group and the first structure found to exceed 3 billion light-years. U1.11 LQG (2011) 2,500,000,000 Involves 38 quasars. Adjacent to the Clowes-Campusano LQG. Clowes–Campusano LQG (1991) 2,000,000,000 Grouping of 34 quasars. Discovered by Roger Clowes and Luis Campusano. Sloan Great Wall (2003) 1,380,000,000 Discovered through the 2dF Galaxy Redshift Survey and the Sloan Digital Sky Survey. BOSS Great Wall (BGW) (2016) 1,000,000,000 Structure consisting of 4 superclusters of galaxies. The mass and volume exceeds the amount of Sloan Great Wall. Pisces-Cetus Supercluster Complex (1987) 1,000,000,000 Contains the Milky Way, and is the first galaxy filament to be discovered. (The first LQG was found earlier in 1982.) A new report in 2014 confirms the Milky Way as a member of Laniakea Supercluster. Caelum Supercluster 910,000,000 Caelum Supercluster is a collection of over 550,000 galaxies. It is the largest of all galaxy supercluster. 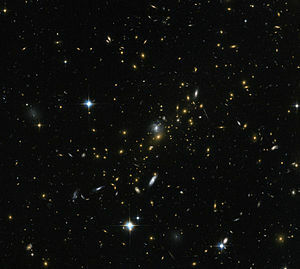 Saraswati Supercluster 652,000,000 Saraswati Supercluster consists of 43 massive galaxy clusters, which include Abell 2361 and ZWCl 2341.1+0000. Horologium Supercluster (2005) 550,000,000 Also known as Horologium-Reticulum Supercluster. Shapley Supercluster 400,000,000 First identified by Harlow Shapley as a cloud of galaxies in 1930, it was not identified as a structure until 1989. SCL @ 1338+27 228,314,341 One of most distant known superclusters. Voids are immense spaces between galaxy filaments and other large-scale structures. Technically they are not structures. They are vast spaces which contain very few, or no galaxies. They are theorized to be caused by quantum fluctuations during the early formation of the universe. A list of the largest voids so far discovered is below. Each is ranked according to its longest dimension. (most likely value) A recent analysis of the Wilkinson Microwave Anisotropy Probe (WMAP) in 2007 has found an irregularity of the temperature fluctuation of the cosmic microwave background within the vicinity of the constellation Eridanus with analysis found to be 70 microkelvins cooler than the average CMB temperature. One speculation is that a void could cause the cold spot, with the possible size on the left. However, it may be as large as 1 billion light-years, close to the size of the Giant Void. ^ Horvath, Istvan; Bagoly, Zsolt; Hakkila, Jon; Tóth, L. Viktor (2014). "Anomalies in the GRB spatial distribution". Proceedings of Science: 78. arXiv:1507.05528. Bibcode:2014styd.confE..78H. ^ Horvath, Istvan; Hakkila, Jon; Bagoly, Zsolt (2014). "Possible structure in the GRB sky distribution at redshift two". Astronomy & Astrophysics. 561: id.L12. arXiv:1401.0533. Bibcode:2014A&A...561L..12H. doi:10.1051/0004-6361/201323020. ^ Horvath, I.; Hakkila, J.; Bagoly, Z. (2013). "The largest structure of the Universe, defined by Gamma-Ray Bursts". 7th Huntsville Gamma-Ray Burst Symposium, GRB 2013: Paper 33 in eConf Proceedings C1304143. 1311: 1104. arXiv:1311.1104. Bibcode:2013arXiv1311.1104H. ^ Klotz, Irene (2013-11-19). "Universe's Largest Structure is a Cosmic Conundrum". discovery. Retrieved 2013-11-22. ^ a b c Balazs, L.G. ; Bagoly, Z.; Hakkila, J.E. ; Horvath, I.; Kobori, J.; Racz, I.I. ; Toth, L.V. (2015-08-05). "A giant ring-like structure at 0.78 < z < 0.86 displayed by GRBs". Monthly Notices of the Royal Astronomical Society. 452 (3): 2236–2246. arXiv:1507.00675. Bibcode:2015MNRAS.452.2236B. doi:10.1093/mnras/stv1421. Retrieved 5 August 2015. ^ Aron, Jacob (2013). "Largest structure challenges Einstein's smooth cosmos". New Scientist. New Scientist. 217 (2900): 13. Bibcode:2013NewSc.217...13A. doi:10.1016/S0262-4079(13)60143-8. Retrieved 14 January 2013. ^ "Astronomers discover the largest structure in the universe". Royal astronomical society. Retrieved 2013-01-13. ^ Clowes, Roger; Harris, Kathryn A.; Raghunathan, Srinivasan; Campusano, Luis E.; Söchting, Ilona K.; Graham, Matthew J. (2013-01-11). "A structure in the early Universe at z ∼ 1.3 that exceeds the homogeneity scale of the R-W concordance cosmology". Monthly Notices of the Royal Astronomical Society. 1211 (4): 6256. arXiv:1211.6256. Bibcode:2013MNRAS.429.2910C. doi:10.1093/mnras/sts497. Retrieved 14 January 2013. ^ H.Lietzen; E.Tempel; L. J.Liivamägi (20 March 2016). "Discovery of a massive supercluster system at z ~ 0.47". Astronomy & Astrophysics. 588: L4. arXiv:1602.08498. Bibcode:2016A&A...588L...4L. doi:10.1051/0004-6361/201628261. ^ a b c d e f g h i j k Komberg, Boris V.; Kravtsov, Andrey V.; Lukash, Vladimir N. (1996). "The search and investigation of the Large Groups of Quasars": 2090. arXiv:astro-ph/9602090. Bibcode:1996astro.ph..2090K. ^ Webster, Adrian (May 1982). "The clustering of quasars from an objective-prism survey". Monthly Notices of the Royal Astronomical Society. 199 (3): 683–705. Bibcode:1982MNRAS.199..683W. doi:10.1093/mnras/199.3.683. ^ Komberg, B. V.; Kravtsov, A. V.; Lukash, V. N. (1996). "1996MNRAS.282..713K Page 713". Monthly Notices of the Royal Astronomical Society. 282 (3): 713. Bibcode:1996MNRAS.282..713K. doi:10.1093/mnras/282.3.713. This page was last edited on 6 March 2019, at 01:22 (UTC).